Walk to living room, pick up television controller. Turn on television, select input / applicable volume / etc. Pick up gamepad. Turn on power. Five steps. Let's compare this to Nintendo's new console, the Wii U. Walk to living room, pick up Wii U tablet controller. Press TV button on controller, power on television, select input / applicable volume / etc., power on console. Just three! At the risk of sounding like late-night TV pitchmen, we must emphasize how important this is. It remains impressive after days of using the console at home. Ever since we (as a society) first plugged computers called "gaming consoles" into our televisions, we've been following an archaic process of swapping remotes and pushing buttons and all sorts of needless busywork. Nintendo's Wii U tablet controller thankfully streamlines that process in a small, but tremendously meaningful way: during initial console setup, you're prompted to sync your television and the tablet controller, allowing the tablet itself to control the TV's power, volume, channels, and input directly. And let's pause to emphasize the importance of this step as part of the initial console setup, rather than background functionality to be sussed out later on -- this fundamentally transforms how the vast majority of soon-to-be Wii U owners will interact with their Wii U. The console instantly becomes the de facto media unit, interacting with your cable box, DVR, and various digital streaming offerings, as well as directly controlling your television. Even when the console is powered off, the Wii U controller still functions as a television controller -- what Nintendo president Satoru Iwata calls, "a fully independent infrared TV remote." 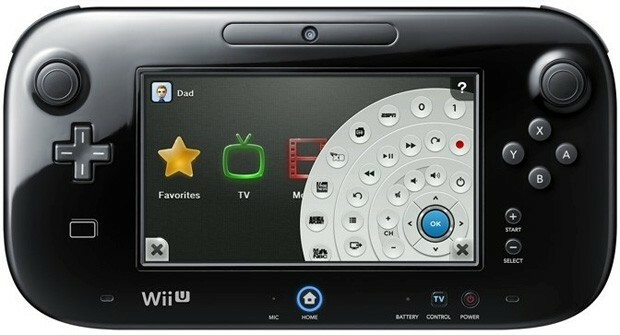 As the TV remote functionality is tied to the Wii U controller's hardware itself, it can be used at any time (mid-game, in the Wii U menu, when the console's powered off, etc. -- think of it as a standalone application). Outside of the few rare times when more advanced TV functionality is required, Nintendo's stand-in for your traditional TV remote control is more than adequate. And the future of this functionality promises even more. Nintendo TVii intends to streamline the experience further, casting aside your cable box remote for built-in channel guides and DVR programming (coffee table's starting to look pretty sparse, eh?). Sadly, we've yet to experience Nintendo TVii in our homes, as the Wii U we've got won't have any media functionality (Nintendo TVii, Amazon Instant, Netflix, Hulu Plus, etc.) until it receives a software patch shortly before retail launch on November 18. Of course, should Microsoft and Sony's next-gen consoles offering similar convenience -- and by all accounts, Microsoft certainly seems to be headed in the media center direction too -- the Wii U may face challengers. For now, getting out ahead of the other guys with a stellar product (at least in this regard) certainly won't hurt.